We are much more than just a hotel. Indeed, we are a 12th century Cistercian monastery refurbished as a hotel by the government of Galicia. 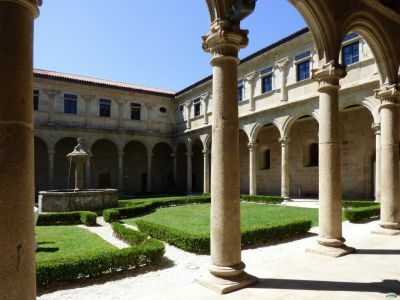 In its origins it was the home of Cistercian monks, later of Benedictine friars and, nowadays, it throws open its doors so that you can revel in the peace and quiet of its cloisters, its cells and the marvelous surroundings, in the heart of the Ribeiro wine country, in the province of Ourense. Apart from being hotel, the Eurostars Monasterio de San Clodio is an exceptional choice for holding banquets and corporate events. The most coveted secret of the Eurostars Monasterio de San Clodio Hotel are the guestrooms, all spacious, facing the exterior, elegantly decorated in harmony with the historical environment, with high ceilings and stone walls and with magnificent vistas over the vineyards and pine woods surrounding the monastery. We have 25 rooms, 21 of which are double and four are suites with adjoining living rooms. The spacious guestrooms, with furniture, carpets and canopies in classical style, are so well appointed that you are unaware of really being in an ancient, medieval cell, with Wi-Fi, satellite TV, mini bar and a fully equipped bathroom. In our restaurant you can relish in a variety of proposals, from an abundant dinner befitting a bishop, to frugal monk's breakfast. We are specialists in typical Galician dishes, from lobster rice, braised veal or spring lamb. We also supply a great variety of wines from Galicia and the rest of Spain. The Lobby Bar is open 24 hours. Breakfast time: 8:30-11:00 , Restaurant: From Wednesday to Saturday, during lunch and dinner hours and Sundays during lunch hours. Enjoy the taste of Ourense helped by our Gourmet Experience! A true gastronomic experience to meet the expectations of the most demanding of palates. This offer includes: - Dinner for one person. - Wi-fi free. *Restaurant closed Sunday and Monday. Enjoy the relaxed ambiance of the San Clodio Monastery Hotel and visit the famous hot baths. This offer includes: - Entrance to the Baths. - Wi-fi free. *(The Baths are closed on Mondays for maintenance) **(One week’s advance booking is necessary) *** Access is not permitted for children under the age of 5, in order to avoid any health hazard. Would you like to enjoy the purest Galician atmosphere? Well, you are in luck, because at the Hotel Monumento Monasterio de San Clodio we have prepared for you everything you need to enjoy the town of Leiro one hundred percent! And if you have decided to travel with your loved one, what could be more romantic than staying in a fully refurbished 12th century Cistercian monastery? Precisely for this reason we have created a romantic package to give you and your loved one the welcome you deserve. We will be pleased to welcome you with a bottle of sparkling wine and delicious bonbons, plus the chance to enjoy a fantastic breakfast in bed. That sounds good, doesn’t it? Well, don’t hesitate any longer and come to see us at the Hotel Monumento Monasterio de San Clodio! Includes: - Bottle of sparkling wine and sweet treat.